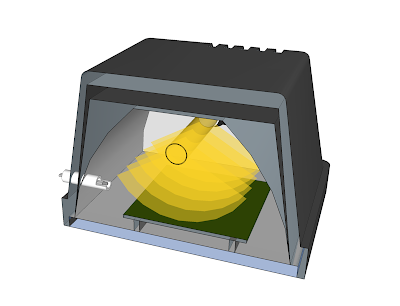 First test was to check the speed of the temperature rise inside a standard halogen floodlight. 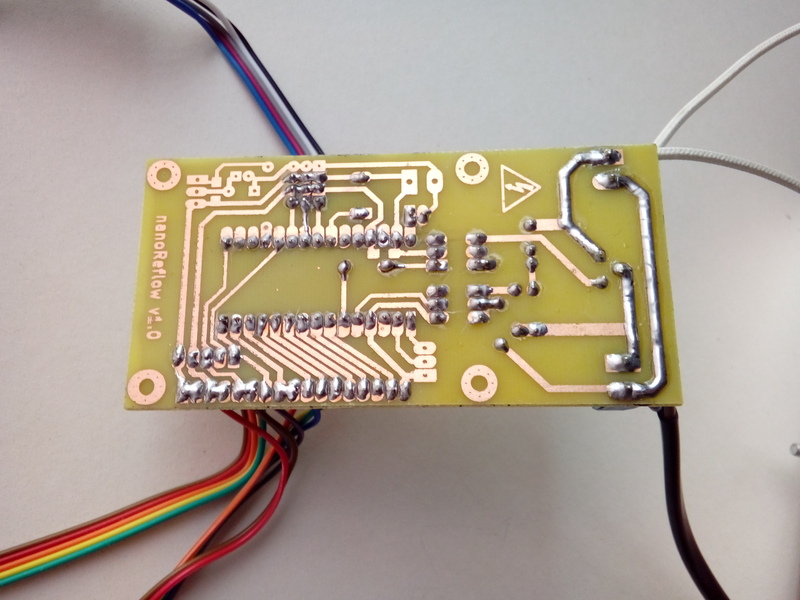 Reflow soldering temperature curves are quite demanding, and some adapted ovens can't reach the degrees-per-second speed of the ramp-up stages of these curves. I bought the spotlight, put an aluminium sheet covering the inside surface of the protective glass (to reduce heat loss), and measured the temperature rise with a multimeter's thermometer.... and wow! More than 5ºC/s... and I better turned the thing off after reaching 300ºC and still rising quickly. So the floodlight was able to fulfill the needs. You can read more about their characteristics in this article. You can read more about AC dimmers here. And more info about detection AC zero cross here. I decided to adapt 0xPIT's reflow Oven Controller to my needs. 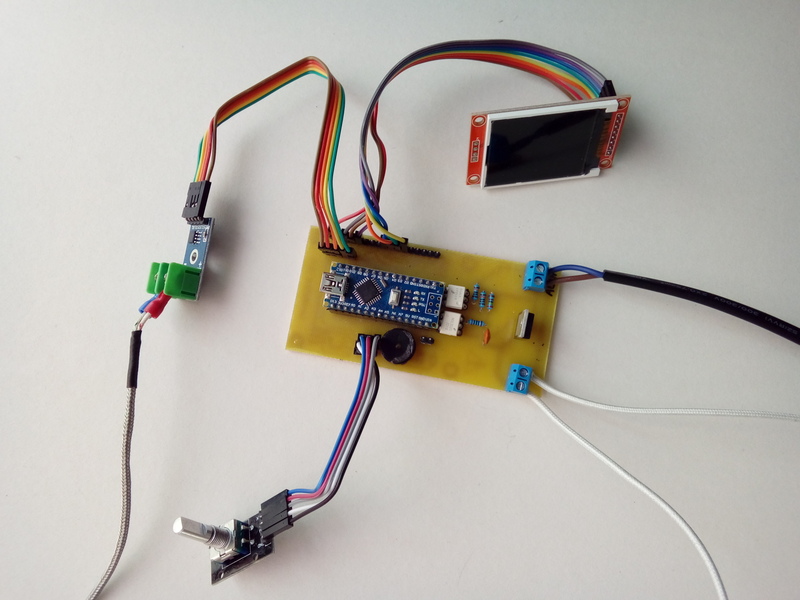 This controller uses a Thermocoulples as temperature sensor, a bidirectional optocoupler as zero cross detector, and a Non Zero Cross SSR (Solid State Relay) as AC commutation device (instead of the combination of an Optoisolator Triac and a Triac ). Then made a new board design, using as dimmer circuit the combination of an Optoisolator Triac and a Triac, wich are cheaper more replaceable and easier to get than SSR's. The board can be made at home on a single side PCB with toner transfer, and in the reflow cicle the triac's temperature stayed well below 60ºC without heatsink, being the load a 500W halogen lamp. 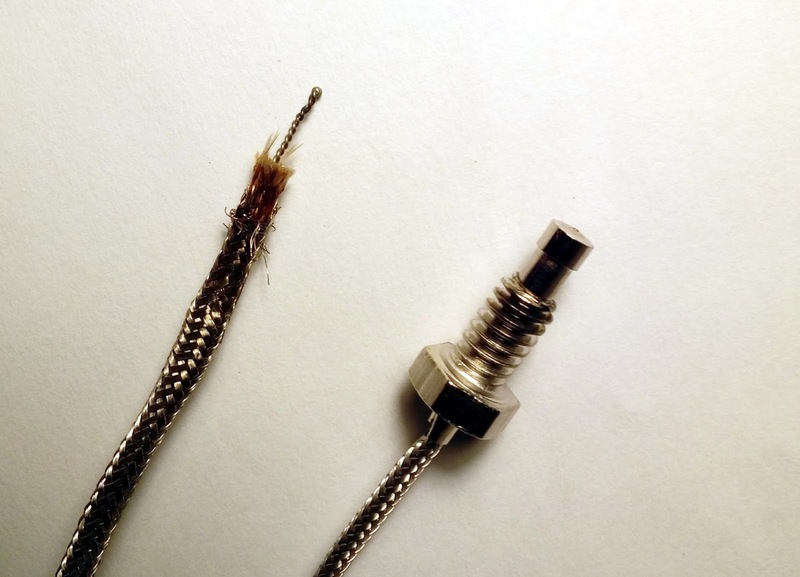 If your K-type thermocouple comes enclosed in a protective metal cylinder, make sure you remove it to get a quick response to temperature changes. 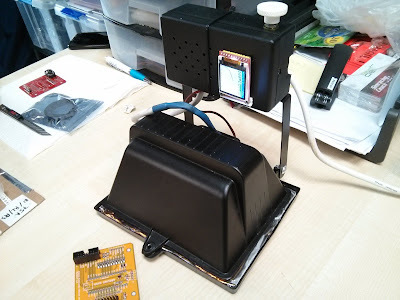 With the controller working, I just drilled the floodlight enclosure to fit the thermocouple. I used a piece of 6mm OD / 4mm ID teflon pipe to add a bit of thermal insulation between the probe and the case's metal. 0xPIT's original code (which I heavily modified for this project) includes PID to match the required temperature curve. The PID parameters have to be tuned for each hardware setup, changes in the power/size of the floodlight, position of the probe, etc. However, you should be conservative, as the geometry of the heat radiation from the bulb to the board changes a lot with distance, so the center of the board you are cooking will be hotter than the thermocouple reading. 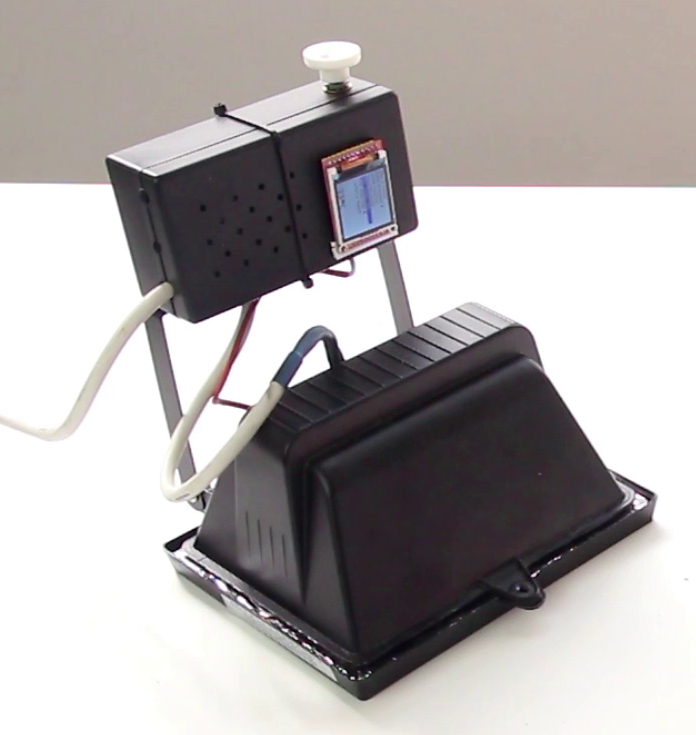 That means you should keep the peak temperatures at the minimum usable for the reflow. To give you some practical numbers, I'm using a peak temperature of 200ºC, so the temperature at the center of the board (shortest distance to the lamp) reached around 220ºC. That's Ingenious! I bow to you in respect! may want to consider posting this on hackaday.io, I'm sure a lot of people would be interested. I've only seen one project which was similar, which used one of those glass cooking appliances which also used a lamp to cook the food. Halogen bulbs must be operated at no less than about 90% of rated voltage. Otherwise the regenerating effect of the halogen gas to redeposit the tungsten on the filament stops. You will notice a buildup of the tungsten on the bulb glass over time. And the filament fails. continuous dimming. That might help the lamp as it would see multiple full-on / full-off cycles rather than an intermediate temperature ? Hey your process for applying solder paste looks really neat, can you detail it a little more ? I made the stencil for the solder paste with the aluminium of a soda can. Had to sand off the coatings/paint of the aluminium before etching the stencil with the same toner transfer technique used to etch PCBs. Ah cool, thanks. And is it just stock cardboard that holds everything in place ? What are you using to squeegee the paste on ? Yes, a thin cardboard to keep the board and the stencil aligned. My friend Carlos (the one in the video) used a pointy wood stick to apply the paste. However, the most common way to do it is with a "solder paste squeegee". Hello, I tried your sketch. Everything is going fine. Except one thing: I can't get the encoder running. I am using the same encoder as in your photos. The program detects when the encoder is turned right or left. But it doesn't detect if the encoder is clicked or not. Everything is fine with my wiring, and the voltage on the pin where I connected the encoder is going perfectly down when I click it. Hello. I downloaded your sketch. I works good, except one thing: I can't detect wheter the encoder is clicked or not. The program gets it when the encoder is turned left or right. But a click isn't reckognized. The encoder setup, I set it on low, is correct and the voltage on my declared encoder-button-pin drops perfectly when I click it. Do you have any ideas what could be wrong? PIN_ENC_A (A2) ---> encoder "CLK"
PIN_ENC_B (A3) ---> encoder "DT"
PIN_ENC_BTN (A4) ---> encoder "SW"
5 volt ---> encoder "+"
It seems that there is something false within the code. The wiring is correct and if I try the Encoder in an example called ClickEncoderTest of the library it works fine. I modified the part of the loop where it handles the encoder.button "case ClickEncoder::Clicked:" with "if (digitalRead (PIN_ENC_BTN ) == false)". Of course I can't double click right now. Do you have any idea why it isnt working? Well, it works for me. I've just downloaded again the encoder library form 0xPIT's repo and uploaded the code and it works fine. Is your mains 50Hz or 60Hz? Hi, did you find/fix the problem? I have 1 Problem. I am not getting any temperature values. It`s always "0". If i load any max6675 example sketch its working fine. I also activated SERIAL_VERBOSE, also "0" only. There might be spi communication interference between your LCD and the max6675. I'm away home, so can't try things. Adding delay didn`t help. But I get Values if i deactivate the LCD( //setupTFT() ). So we are not far away. I maybe should have mentioned that i am using an ILI9341 Display instead of your ST7735. Yes, that one will work. BTA08-600 should work too. David, where did you source the heatsink? Im unable to find this cross-section heatsink anywhere. Farnell has a pretty impressive selection, but none of them really fit your outline. Sorry for the late reply, look for Fischer SK 409, it should appear. It's a very interesting project. I've made one and now I'm testing. Everything works but when I hit "start cycle" it stop working and doesn't open the cycle diagram page. Any ideas what's going on or how to circumvent this? Can you try with a newer IDE and having a separate sketchbook with just the libraries needed for the nanoReflow ? Hi, I reproduced your project and it works nice. Really good idea, thank you ! Only one minor issue: the timebase is 2X too slow, I put TICKS_PER_SEC=50 as a workaround, but I have to explore that issue. Please share your findings about the timebase issue. Olivier, do you have a git somwehere with the changes - I believe I have the same issues with the timebase but have solved it in a different way. Also which display are you using? Mine display misses the last 5 horizontal pizel coumns - its not a huge issues, just inconvenience. Oh comon! I have been using the oven for the last 4 months! :) Works a treat! Am I the only one with clock issues ? How is your issue demonstrated? I may have the same issue, but possibly not. 2.- AC power is plugged, no need to start the cycle. David, have you ever gotten around to adding the 12V fan to your setup? Where were you intending of putting it, anyhow? Another, bigger, hole at the back of the light enclosure, above or to the side of the thermocouple? I've never added the fan. I just open the enclosure when I hear the "end beep" to reduce the cooldown time. 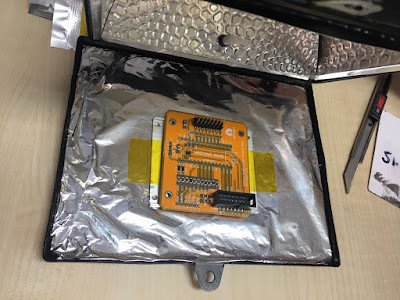 One problem is it would need a path for the air to flow in/out only at the cooldown time, but keeping the heat enclosed during the heating/reflow process. That's what I've been wondering about ... something could be constructed with a servo sliding either a cover or the fan in place, but then that would require making a hole of significant diameter in the enclosure and attaching two rails or something of that sort to it within which that sled could move. Seems like overkill. I've forked your project on GitHub and would love to remove the circuit parts for controlling the fan and open a pull request. Unfortunately, I'm not sure how to get your parts and footprints into my KiCAD so that it stops complaining when I open the schematic... any chance you have these lying around somewhere? Привет! Спасибо за работу. Повторил и все работает!Помогли комментарии. Привет! Повторил и все работает. Спасибо!